The Seahawks rebound from their first preseason loss to annihilate the Chargers 41-14. The interception and touchdown by Tharold Simon is one example of how games how now turned into an illegal contact-fest and has officials seeing things that just aren't there. 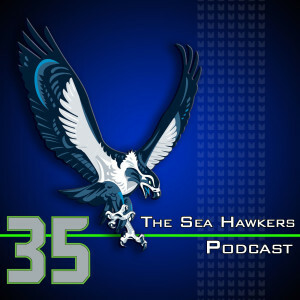 Seeing Earl Thomas continuing to field punts continues the discussion on whether or not the risk is worth the potential reward, Adam and Brandan talk about impressive performances in preseason game two, and discuss if Terrell Pryor is poised to unseat Tarvaris Jackson as the backup. Jenny Goos, writer and vlogger for OnHerGame.com joins the podcast for her third appearance on the show. With two weeks of preseason down, Jenny talks about how she's tired of watching “practice” and ready to get to the regular season. Do better candidate Johnny Manziel is called out for his poor execution of a gesture we've seen from Marshawn Lynch, Michael Vick and late Titans owner Bud Adams. Adam takes one more run at the flurry of illegal contact penalties being called. Finally, tune in to the show and find out why free agent NHL left winger Paul Bissonnette and Russell Wilson are both better at life than Skp Bayless.